In the first year, the children will learn about the Sacrament of Reconciliation, also known as Penance or Confession. Topics include the Ten Commandments, Examination of Conscience, Penance and Absolution, and Morality. Reconciliation will be celebrated during Lent. The children will the following prayers: Sign of the Cross, Our Father, Hail Mary, Glory Be, and the Act of Contrition. 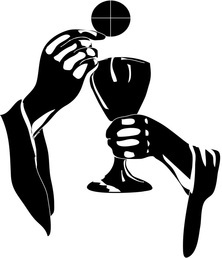 In the second year, the children will learn about the Sacrament of Holy Eucharist (Communion). They will learn about the true presence of Jesus in the Eucharist as well as how to receive. Topics include Baptismal Promises, the Penitential Rite, the Mass as Sacrifice, the Last Supper, The Communion Rite, and the Mission of the Church. The importance of attending weekly Sunday Mass becomes more evident at this time. Before the First Eucharist liturgy, parents and children will attend a Parent/Child Eucharist Retreat. This retreat provides a day of prayer and reflection. Retreats are a great way to remove ourselves from the busyness of life and focus on our relationship with God and the Lord’s presence in our lives. With open hearts, parents and children will be spiritually prepared to receive the Lord in the Eucharist at the First Eucharist Liturgy. Know the following prayers by the second year: Sign of the Cross, The Our Father, The Hail Mary, The Glory Be, and the Act of Contrition. Girls wear white dresses. Off white or beige is not acceptable. The dresses must be floor or knee length. No strapless or spaghetti strap dresses unless a little jacket or sweater is worn. Shawls are not accepted. Shoulders must be covered. They can wear white shoes and stockings or socks. Usually veils or flowers are worn in the hair, but this is optional. Gloves may be worn for pictures, but not for the First Eucharist Liturgy. Girls who wear gloves will be instructed to remove them prior to the beginning of Mass. Boys wear dress pants (black, dark blue, gray or white), long or short sleeved button-down, collared white shirts, and black or white shoes/socks. Suit jackets and ties are appropriate but optional.